Fiction is not always a far cry from reality. In Crazy Rich Asians, British actress Gemma Chan plays Astrid Teo, a richer-than-rich socialite with a heart of gold. She may be a supporting actress, but her character's costume wardrobe could compete with Beyoncé's. The fashion was so extravagant (we're talking about Dior, Chopard, Valentino...the list goes on) that it had its own security. Unfortunately, the cast had to return all the couture creations, but you'd never know it by the looks of Gemma's personal style. Even before the highly anticipated flick premiered, the Captain Marvel star was enchanting us in Burberry, Dolce & Gabbana and even contemporary brands like Self-Portrait. You may have not recognized her then, but you'll definitely know her now, especially as fashion outlets like British Vogue, Fashionista and Vanity Fair continue to spotlight the rising style star. What do we already know? The British beauty has classic, streamlined style, mostly opting for monochrome looks, column-like silhouettes and clean lines. Gemma is a fan of lace and high necklines but won't shy away from head-turning sequins and prints. Most importantly, the star supports the usual red-carpet-friendly fashion houses but is also a big proponent of Asian designers as well, including Prabal Gurung, Opening Ceremony's Carol Lim and Humberto Leon and more. To see how Gemma is making a mark in the fashion world, click through. 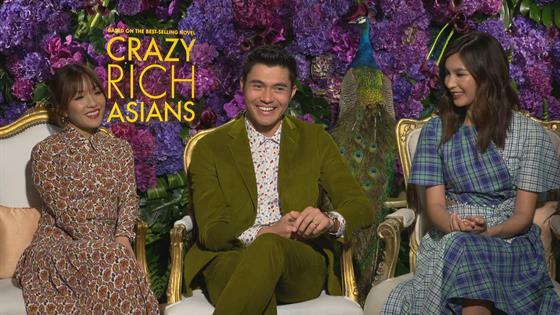 "Crazy Rich Asians" Stars: "It's Not Just a Movie, It's a Movement"